Parents can make use of these simple sensory integration activities and exercises to complement occupational therapy sessions that their child may be receiving. over responsive to sensory stimulation. Over responsive children are sometimes described as tactile defensive or sensory defensive. 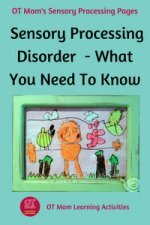 If these terms are new to you, pop over and read my information page on sensory processing disorder to get a better understanding. If your child is receiving occupational therapy, please ensure you check the suitability of the activities with your child's therapist! The information on this page is not a substitute for an occupational therapy evaluation! The beauty of a “sensory corner” is that it can provide stimulation to the under-responsive child, sensory input for the sensory seeking child, and a safe retreat for the sensory defensive child. 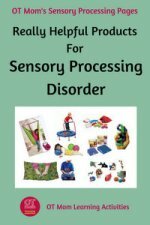 Having a safe space that can help a child deal with sensory processing issues is an important step in assisting the child to recognise strategies that work for his/her specific needs. There is no set recipe or instructions for making a sensory corner - you will need to discover what your child responds well to by observing your child, talking with your child, and getting feedback from therapists and teachers who are involved with your child. You can make your sensory corner fit your budget and your resources, as well as the space you have available! Make a "Sensory Corner" by blocking off a corner of the room and using soft furnishings with a variety of textures. 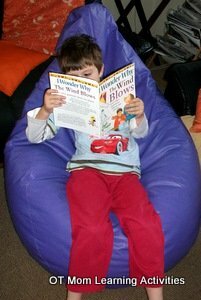 A big comfy beanbag provides wonderful deep pressure and a snuggly effect which can be very calming. You can also make a giant pillow or use an old mattress that can also double as a crash pad if your child wants to throw him/herself down on it! Some children enjoy being competely secluded in a little tent or wigwam. Others, however, prefer to not be closed off, so find out what works for your child! Some children find a lava lamp or fish aquarium soothing to look at, and others appreciate having headphones with which they can listen to soft soothing music. You can view Lava Lamps on Amazon (this is an affiliate link). A "sensory box" is filled with objects that have different textures and weights. Fiddling with or touching these objects could be soothing for an overstimulated child, or calming for a child who is wound up and sensory seeking. Items in the box can also be used to help a distracted child focus on listening to a book being read or paying attention to a lesson. Find out more about how to make your own sensory box with objects you probably already have at home! Information from the muscles and joints is called proprioception. Proprioceptive information comes to the brain from muscles and joints which are involved in activity, especially when they are working hard. That is why they are often referred to as heavy work activities. Heavy work activities help your child to really “feel” their muscles and joints working, and the proprioceptive information sent to the brain helps your child's brain to better integrate sensory information. 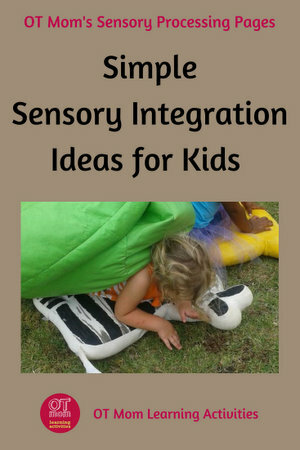 These are excellent sensory integration activities for kids who are always craving movement and crashing into things. They can also help stimulate a lethargic child. Let your child push a trolley, sweep the yard, dig in the garden, or any other activity that lets their muscles work hard. Jumping on a trampoline and climbing on playground equipment also gives good proprioceptive input. If your child struggles to sit still to listen to a lesson, then try a stress ball to squeeze, chewing gum, or a special chew toy to give proprioception input. 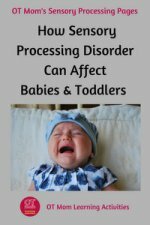 Giving deep pressure is a very effective way of helping an overstimulated or distressed child to calm down and reorganize his/her emotions and behaviour. Have you ever felt much better after getting a bear hug from someone you love? Deep pressure works the same way! Although it seems passive, these deep pressure ideas are great sensory integration activities. Let your child lie on a mat or folded blanket and pack pillows on top to make him into a pizza or sandwich. Very Important: Never cover your child's face!! Your child may also enjoy being wrapped in a blanket or snuggling in a beanbag for some deep pressure stimulation. The child in the photo is sitting in a snug kiddie armchair and using a hand-held massager. The snugness of the chair helps him feel secure and the massager gives him vibration and deep pressure input. Most movement activities will stimulate the vestibular system in the inner ear, which helps the body to know how it is moving and how fast it is moving. Depending on their intensity, vestibular activities can be stimulating for an under-responsive child, or calming for a sensory seeking or over-responsive child. Trampolines, rocking horses, swings, roundabouts or slides are all good vestibular sensory integration activities. Here are a few vestibular exercises you can try in the classroom, as well! A child who is gravitationally insecure may fear movement and avoid escalators, elevators and playground apparatus. They need to experience very gentle, safe movement. It will be less scary for them to move while sitting or lying down, rather than while standing up, or to try a gentle activity while being held by a parent. Try gentle bouncing on a trampoline while lying or sitting, swinging on a very low swing, and rocking on a rocking horse. Be careful not to force a fearful child to take part in an activity – be guided by your child's reactions. Some children chew excessively on clothing, pencils and other inappropriate objects. They are usually seeking tactile and proprioceptive input through their mouths, perhaps to help themselves concentrate or to reduce anxiety. Blowing bubbles in a bowl of water with a straw, drinking thick milkshake/yogurt through a straw and blowing on harmonicas are activities that can help meet a child's oral-motor needs.Some kids benefit from chewing gum, while others need something more durable. PFOT carry a range of oral-motor products, while MamaOT has 5 tips to help kids who chew on everything! 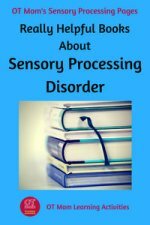 I review a variety of books on sensory processing on this page of my site. There are books for preteens as well as for parents, teachers and therapists! 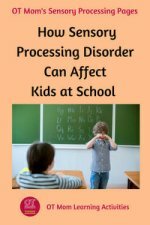 For a range of sensory integration activities and tips that you can use to help children with sensory processing disorder, I really recommend No Longer A Secret (the link takes you to my brief review of the book on my site). It is full of practical, easy-to-implement ideas that be can used at home and at school. View the full range of products at PFOT. These related pages on my site may also be helpful for you. These books are my go-to whenever I need inspiration for activities to help kids with sensory integration issues. 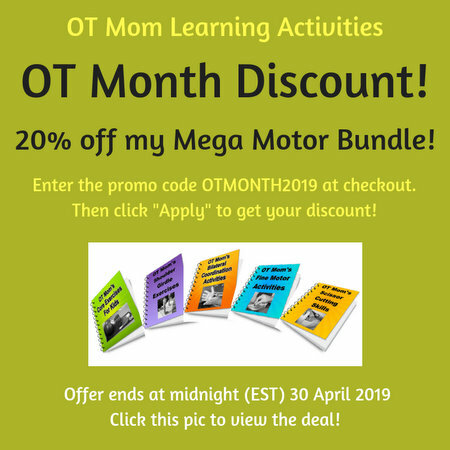 You can view brief descriptions of each book on my OT Books page. Thank you for visiting my page! I hope you found it useful!